School is a lot different today than it was two years ago at P.S. 171, Patrick Henry Preparatory Academy in Harlem, NY. In 2016, when teachers wanted students to use computers in class, they rolled in the computer cart. Students lined up, took the laptops from the cart and brought them back to their seats. At the end of class, students lined up again to put the laptops back in the cart so they could be rolled over to the next classroom. Today, all the students and teachers have their own tablets with always available access to the internet. Students are using technology in their daily work in all their classes. They’re using the internet to do research, video to express creativity and virtual reality to explore the world. 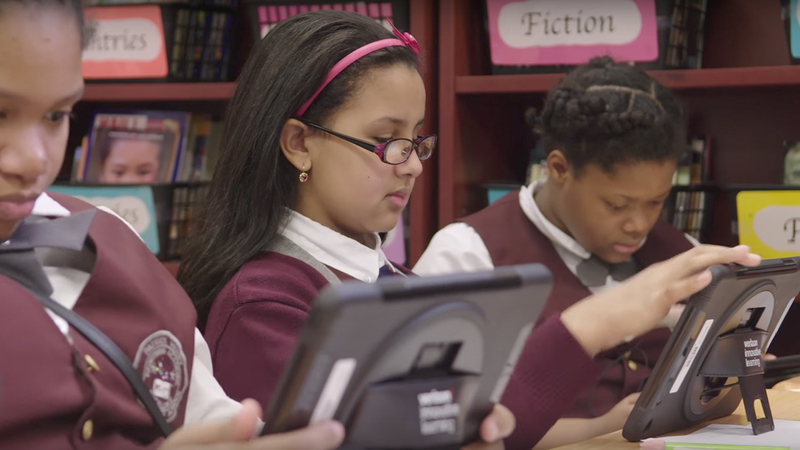 Teachers are adept at integrating technology as a powerful tool to help students master skills they’ll need to succeed in the digital economy. And the school is being completely transformed. P.S. 171 is in its third year of participating in a holistic program that gives free technology, internet access, professional learning and STEM curricula to under-resourced schools in America. Called Verizon Innovative Learning, the program is offered by the Verizon Foundation in partnership with the leading educational nonprofit Digital Promise. This is one factor contributing to the school’s being named one of America’s Best Urban Schools (ABUS) by the National Center for Urban School Transformation. As a Gold level winner, P.S. 171 is one of only four schools in the country to achieve this prestigious honor in 2018. It is one of only three schools in New York City to earn the ABUS designation since it was created 12 years ago. ABUS schools are recognized for their high rates of academic proficiency for every racial/ethnic group, high achievement rates for English learners, high degree of proficiency for students with disabilities, excellence in STEM education, high attendance rates, low rates of out-of-school suspension, high graduation rates, college credit and AP course completion, and dropout recovery.